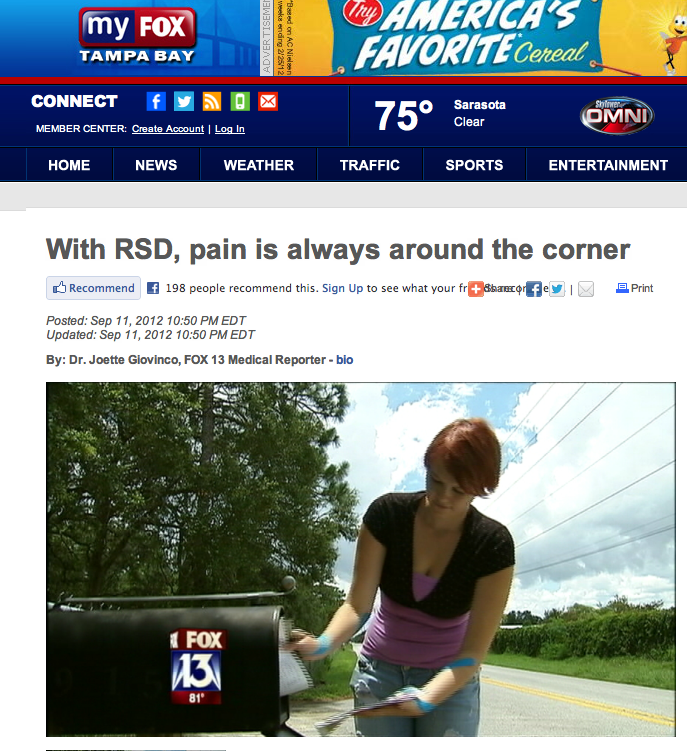 TAMPA (FOX 13) -She’s only 17 years old, but a medical condition has forced Lorna Steff to endure more physical pain than most of us experience in our lifetime. Lorna dreams of a future when she can walk down the runway as a professional model. But right now, even a simple walk to her mailbox sometimes seems impossible. “I want to be on the cover of Vogue. That is my ultimate goal, and I’m gonna establish that, I swear,” Lorna says. Lorna has won pageants, and she’s built a portfolio. Still, she faces fierce competition from unbearable pain. “My usual pain is like someone takes a knife, and is twisting it into your body. It’s excruciating,” she says. Lorna has a neurological condition called Reflex Sympathetic Dystrophy, or RSD for short. “It was frustrating because out of all this pain out of nowhere,” she said. Medicine helps. But a new problem threatened Lorna’s modeling and independence: she sometimes temporarily loses her vision. It can happen anytime, anyplace. “It’s like going outside in the middle of the night and you can’t see anything. It’s pitch dark,” she says. It’s hard for Lorna’s mom to watch her daughter go through it all. “I don’t know how to describe it, it just tears your heart,” explains Lorna’s mother, Leslie Coffey. She’s watched the RSD get worse. Sometimes Lorna needs a wheelchair, since walking is too painful and tiring. “You try not to cry in front of them, you try to be the brave one, you try not to show your emotions, but there are sometimes when you just can’t help it,” Leslie says. Determined to not close the book on her future in modeling, Lorna is seeing a four-legged partner: a guide dog to help keep her balance and break her falls. Lorna’s search for a guide dog has taken her as far as Georgia, after making some high-profile connections here in Tampa. She met Atlanta-based online radio host Blake “Top Dog” Rashad, who connected her with a guide dog training program based out of a jail there. Inmates train pound dogs to become guide dogs, and they matched Lorna with a Great Pyranees by the name of “King.” Lorna raised money, and traveled to Atlanta to train with him. Unfortunately, the match was not meant to be. Vets discovered King had a hip problem, and it prevented him from getting guide dog certification. While the news was disappointing, Lorna continues her search for a guide dog continues. “You have to stay strong, you have to have a level head, and be confident in yourself. You have to accept yourself for who you are and keep moving forward,” she said.